CHINO, Calif.--(BUSINESS WIRE)--KB Home (NYSE: KBH) today announced that new KB homes are now available at the builder’s Turnleaf community, a stylish collection of single-family residences in Chino. Turnleaf’s prime location near California State Routes 71, 91 and 60 as well as Interstates 10 and 15 offers convenient commuting to employment hubs throughout Riverside, San Bernardino, Los Angeles, and Orange Counties. Turnleaf features planned private amenities for resident use, including a pool, tot lot, and basketball court. Residents can also enjoy a plethora of recreational activities at nearby Prado Regional Park and Chino Hills State Park, including camping, fishing, hiking, horseback riding, and archery. Golf enthusiasts can tee-off at Vellano Country Club. A variety of shopping, dining and entertainment establishments are located close to the community at The Commons at Chino Hills, Crossroads Entertainment Center, The Shoppes at Chino Hills and Chino Spectrum Town Center. Turnleaf is also located in the highly rated Chino Valley Unified School District. As part of KB Home’s unique homebuying experience, buyers who purchase at Turnleaf will have the opportunity to personalize many aspects of their new home at the KB Home Design Studio, a retail-like showroom, where shoppers, guided by one of KB Home’s design professionals, can create the home of their dreams. Like all KB homes, those offered at Turnleaf will be built to ENERGY STAR 3.0® guidelines and include WaterSense® labeled faucets and fixtures, meaning they are designed to be more energy- and water-efficient than most other typical new and resale homes. The water- and energy-saving features built into every new KB home can help homeowners save on their monthly utility bills. KB Home’s model homes at Turnleaf are now open to the public at 13060 Irisbend Ave in Chino. From the CA-71 heading North, exit CA-83/Euclid Avenue and turn right onto Euclid Avenue. Then turn right on Pine Avenue, left on Mill Creek Avenue, left on Bickmore Avenue, right on Dexter Street and follow signs to the Sales Center. The Turnleaf sales office is open Monday 1:00 p.m. to 5:00 p.m. and Tuesday through Sunday 9:00 a.m. to 5:00 p.m. For more information about KB Home’s Turnleaf, or its other new home communities in the Inland Empire, visit www.kbhome.com or call 888-KB-HOMES. KB Home (NYSE: KBH) is one of the largest homebuilders in the United States, with more than 600,000 homes delivered since our founding in 1957. We operate in 35 markets in 7 states, primarily serving first-time and first move-up homebuyers, as well as active adults. We are differentiated in offering customers the ability to personalize what they value most in their home, from choosing their lot, floor plan, and exterior, to selecting design and décor choices in our KB Home Studios. In addition, we are an industry leader in sustainability, building innovative and highly energy- and water-efficient homes. We invite you to learn more about KB Home by visiting www.kbhome.com, calling 888-KB-HOMES, or connecting with us on Facebook.com/KBHome or Twitter.com/KBHome. 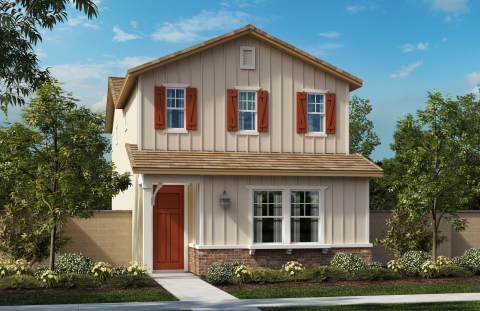 KB Home announces the grand opening of Turnleaf in Chino.